Os mobs são bem fortes, por isso se não estiver em grupo, você deve contar com artimanhas para evitar confrontos, como por ex possuir invisibilidade. A ideia geral é usar as armas deles contra eles próprios, espalhados pela região você encontrará caixotes de munição e a munição (você poderá ver o status da quantidade que você possui numa barra horizontal em sua tela) é usada nas diversas armas espalhadas pelo fosso. - Planos de Sinal de Fumaça - Você marca uma área no chão para a passagem de um bombardeio. - Um cristal laranja que lhe concede um buff de 5min que dá dano de fogo a inimigos quando os mesmo te atacam; (procure por eles dentro de casinhas de madeira suspensas pelo paredão, foi onde eu encontrei em maior quantidade). Sem usar essas armas eu aconselho a focar nos Operário de Ferro .Cada um concede 1% no progresso e tem chance de dropar o Cristal Apexis Cristal Apexis. Estando com os bufs ativos esses npcs chega a levar HK. Like this you can solo complete the quest in 10 seconds. There is a bar at the bottom of your screen that fills up with the killing of mobs in the area. Fill the bar (like the bar on some Cata or MoP raid encounters - Sha of Pride as a recent example) and you complete the quest. As Mouzi said, if you spot a rare, your group should head out to it. Currently, there are a lot of people working this quest for crystals (you need just under 5k for the Legendary ring questline) so dont sell yourself short by going in less than 5. Typical 5 man party should work as there's a lot of dmg that goes out. The best ones are the Iron Demolisher (costs 30 ammo) or the Iron Star (20). Another way of soloing is aoeing Iron Laborers. There's a whole bunch of them at the north end (49, 24), second lowest tier, respawning quickly, with no elites there. If your class is good at aoe it might well be faster (and is certainly easier) than dealing with elites & ammo. Except in the case of morbid curiosity; i.e. you're curious about the various ways in which to die while attempting to solo this, then don't waste your time with it. Yessss it can be done but is a major pain in the behind and NOT worth the aggravation for 200 extra apexis crystals. This quest does not seem to be available from the quartermaster. Brought to you by Chris Pratt. I am a solo player, I do not like group quests, I don't do guilds. I only play an hour or two a day. After reading all the info on here as to how to solo this quest, I tried and tried, killed myself off maybe 10 times and was still at 0% on the bar. 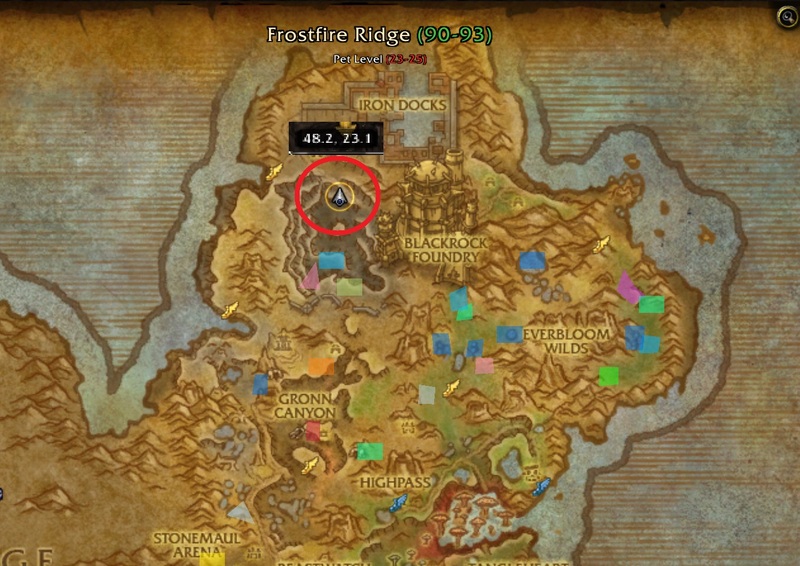 I finally figured out how to solo this (if you have the time); I'm a hunter, horde side: stay at the very top of the pit, right at the entrance. There will be a 101 elite that comes running to you from that first bridge... I just worked on him until I got to about half my health, I then jumped on my mechashredder and had no problem finishing this elite off. It gave me 5% on my bar. So it's gonna take me 20 kills and I have to wait 10 minutes between usages of the mecha, but I'll at least get it done. If you don't have the mechashredder, try the special ability that you have. And good luck! EDIT TO ADD: This worked like a charm, and I got it done much quicker than killing a 101 elite 20 times... I found that if I go to the entrance bridge, get about half way across and fight the 101 elite, I then finish crossing the bridge and let a prisoner free, I end up getting 12% each time. Hope this works for you solo players out there... I'm at 98% right now, just one more little elite to get. A little tip for Rogues (and other classes with CC): Sap (or CC otherwise) the Torturador Repulsivo and free the prisoner. They usually are far enough from the elite packs. In general CC is useful and it makes gathering ammo much easier. Any clues on how often this one shows up? I have checked every day for months. This has finally gotten a Scouting Missive now at the Garrison Quartermaster. As of 12/29/15, this quest was available to me from the Garrison Quartermaster. Just solo'd at 710 ret pally. No tricks - just stay high and don't touch reinforcements as they pull as a mob. Destrua os depósitos de armas da Horda de Ferro e elimine o máximo de inimigos que conseguir. A Horda de Ferro está armazenando armas e munição perto da Fundição. A campanha de Draenor vulnerabilizou seus depósitos. Vá até lá e espalhe o caos, e aproveite o ensejo pra usar a munição contra eles mesmos, já que a deixaram jogada de qualquer jeito!